Dia Man is a popular perfume by Amouage for men and was released in 2002. The scent is woody-spicy. It is still in production. The last few days I have been testing my way through the Amouage range. I ordered some samples and now I know almost everybody. Most of them I like well, some I find solid and some are rather less my case. My favourite is Interlude, Reflection and Sunshine as well as this one. I ordered the noble official sample of this slide. Dia means day and this is actually well wearable, although it is also suitable as a noble evening fragrance. This fragrance is mainly a woody, spicy fragrance with lots of frankincense and especially vetiver. If you don't like vetiver, you won't be very happy with this fragrance. It starts spicy with cardamom and with incense/labdanum mixture, what you also notice in other Amouage's. Gentle wood and vetiver. Vetiver, what is in the base I perceive very early. The flavour is mild and pleasant and goes very well with the vetiver and the soft rosewood. I don't perceive much of the heart note, but I will do my part. For me anyway no fragrance with great fragrance development. But you don't need it here either, because you like to smell this fragrance and leave an elegant impression. Only the base gets through well later and becomes very soft with mainly vetiver and rosewood. Even if I feel this fragrance as an absolute feel-good fragrance, I miss the big wow moments. To me, it's more of an understatement. Very suitable for everyday use, but also a good choice for the evening. It looks very elegant and stylish due to this noble wood-vetiver mixture. For the very special moments, however, I would choose other fragrances. The performance is fine to good. Shelf life is approx. 8 hours. The Sillage is quite good, but not even close to as with Interlude Man. But very satisfying, especially for everyday occasions. All in all a fragrance that I can highly recommend. Very noble and stylish. With my regards to ColinM, I do not know if that is the vintage, but the current one is rather loose for what Amouage usually commercializes. As Gold Man, the first fragrance I’d sampled from the Omani house of Amouage, had set the standard sky-high, I approached the next one, Dia Man, with a fair bit of expectation and a tad bit of trepidation. Would Amouage be capable of creating a follow-up fragrance worthy of their stunning original? To be honest, I strongly wished they would. Dia Man is classified as a spicy-floral-woody scent. Its top features soft spices with a drop of citrus, whose appearance, however refreshing, is only brief. The dominance of the spicy notes lasts until the floral heart of the fragrance opens up. I’d like to point out that the flowers in Dia Man never become as pronounced as those in Gold Man and, therefore, Dia Man may seem more appealing to men than its precursor. In fact, I see the role of the floral notes in Dia Man as that of a bridge between the spicy opening and the woody drydown. The level of blending in this perfume is once again incredible! It’s a truly beautiful chorus of olfactory notes: none is allowed to steal the show, yet each plays its crucial role in the overall effect. Get rid of any one of them and you’ll spoil the whole composition beyond repair. To this nose, Dia Man is as smooth as silk. Even though its projection is moderate, the same cannot be said about its longevity. Once you spray it on, it embraces you gently and you can do nothing but succumb to its charm. Undoubtedly, one of the best Amouages around! Dia Man by Amouage is stunning. Stunning! Not my favourite Amouage to wear “daily” and forget about it, due to its very subtle presence on skin (which for me would be a crime to miss, so I’d rather wear it when I’ve enough attention and peace of mind to appreciate it), but surely and by far, probably my favourite ever of their range as a work of... hell, there, I’ll say it: a work of art. I think it accomplishes a level of vibrant creativity and impeccable perfection no other Amouage ever did, except maybe for Ciel. But Dia probably pushes the limit even above that. It manages to be smoother, to subtract even more, to make an even more precarious, complex and thin balance perfectly stand still as a transparent ice sculpture. Just replacing ice with air. Others in their range are more easy to love, richer and more fulfilling maybe, surely performing better and thus being more appealing and easier to wear. But Dia Man is just something different. On paper it is seemingly quite a simple, understated floral-suede-vetiver scent with spicy-green accents – and you could wonder where’s the deal. The deal is precisely in how Dia transform that mildly promising, yet probably not-overly-exciting structure into something completely amazing. And that sadly can’t really be described with words, which would only make it sound undeservedly boring. Or well, mines would surely. I could mention a mind-blowing weightlessness, a unique sense of natural refinement, an amazingly, almost hypnotic slow evolution bringing in and out vetiver, smooth smoke and posh powdery suede, quiet clean woods, delicate breezy flower petals (orris, peony, ylang) which you can almost feel agitated by some gentle wind, an incredibly crisp yet almost unperceivable sort of grassy-minty aroma breezing erratically through the notes as a fairytale ghost of an elf, a genius touch of silky fruitiness... but that would all make Dia sound “just as another good scent” – while it isn’t. Not because it isn’t good, obviously, but because it’s beyond a scent - it’s a world, really. I would add “totally unparalleled” if Hermès Cuir d’Ange didn’t exist, as in some way, I think these two scents share some connections – both in some notes (especially the powdery-suede treatment), in their stunning quality, and in their general texture and inspiration. But creativity-wise, Dia is probably a tad superior to that, as it dares a bit more in terms of minimalism and complexity. The palette is broader here, so to speak, but surely they share some roots. Pardon this personal detour but in a way, Dia Man reminds me of some summer holidays I used to spend in Switzerland, Engadin valley, some years ago. I always admired and deeply enjoyed the sense of cleanliness, clarity, purity and almost unsettling calm you can feel wandering through the lakes and the Graubünden mountains in the summer season, together with the warm, cozy, subtle yet somehow also very austere, pragmatic, even slightly decadent neat elegance of many houses and cafés there. In my memories the world there was all green and blue with a sprinkle of flowers, a constant uplifting crisp breeze, a Swiss sense of restrained elegance combined with a deep, archaic love for nature and for the mountains, with their dark shades and primitive secrets (which a couple of clouds are enough to transform from heaven to the most frightening place on Earth). I mean, Nietzsche spent his holidays there, in Sils Maria’s village – you get what I mean. It’s not only about some fresh air and good food to seek some rest. It’s like wandering through human nature. Now ironically Amouage’s heritage hasn’t much to do with of all that (or maybe it has? ), and yet the refreshing, soothing sense of sophisticated, almost meditative yet also very “civilized” raw naturalness is quite the same. Probably “natural elegance” hasn’t ever make so much sense as it would for Dia Man. And it’s something really beyond simple charm, or a simple “natural feel”. It’s truly the modulating smell of a whole ideal world in a bottle, a blend of crisp archaic nature and modern cozy refinement. And the choice of giving it such a discreet, subtle texture is just pure genius to me, as it really feels like a call to your sensitivity and intellect to appreciate it at its fullest. Brilliant! Absolutely contrary to what Amouage is known for with their mainstream masculines offerings like Jxxv, Epic , Memoir etc. Dia is a soft , floral spicy and easy going fragrance which is very pleasant and SAFE imo , after a fruity floral start it transforms into a delightful and close to skin powdery/spicy scent constantly whispers its presence and never bothers people around you. comparatively moderate silage and lack of shouting notes made it an Alien among other Amouage masculines. A perfect unisex fragrance imo. Amouage Dia Man (Dia), poor dear, suffers from the Middle Child Syndrome. Dia sits in the long shadow of older Amouage brother, Gold Man, and can't match his egregious, universally adored younger sibling Jubilation XXV. And what's with the names? Dia? Day Among such names as Gold, Honor, Epic, Beloved. You might as well have named Dia Bob. The smart money, though, will look past the names, the hype and Amouage’s own trepidation. 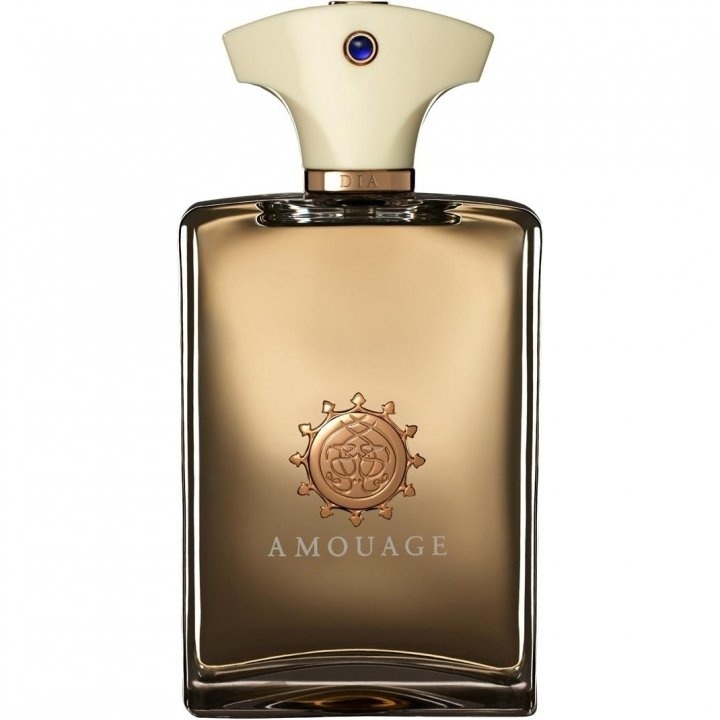 With the substantially quieter Dias, Man and Woman, Amouage wanted to take a step back from the apparent grandness of the Gold twins. The middle child might get lost and become invisible to the outside eye, but for a child with a strong sense of self and a good degree of introspection, this scenario could be perfect. This fictitious child is Dia. Dia has a composure that is ideal for those who appreciate beauty over finery and values refinements over attention seeking. Dia is spicy, woody, ambery and just two shades away from grim. Many of the Amouage men's fragrances are statement perfume's. They announce your arrival. Gold, Ciel, Epic. I'm thrilled to see such unrepentant beauty in masculine fragrances, but as a daily wear, they can be ball busters. Dia is perhaps the perfect daily wear perfume if you wear perfume as a gift to your own soul. Dia works it's magic over time, reminding you that pleasure should be neither postponed nor uncommon. I’d love to try Dia reality-gameshow style as a test of character. Put a sample of men in a room with all the masculine Amouages and ask them to pick the one that they would wear as a signature perfume. Introduce me to the men who choose Dia. Dia, as others have mentioned is a very subtle scent. It starts off fresh and mildly sweet with some cardamom, incense and citrus notes, then turning more towards leather and amber. The leather and amber notes are definitely not "in your face" like a lot of other scents. Instead, like the opening, Dia remains refined, classy, mild and very close to the skin throughout. The scent is so subtle I frequently had to keep smelling my wrists to make sure it was still there, but it was... Very different from other scents from Amouage like Jubilation XXV. At the end of the day, the buyer will need to determine whether Dia is worth its relatively large price tag compared to other options, but from a scent quality perspective it is hard to fault its merits if you are not looking for a more vociferous fragrance. Dia Man is an incredible smelling masterpiece of a scent, and my favorite from the house of Amouage. 5 out of 5 stars.